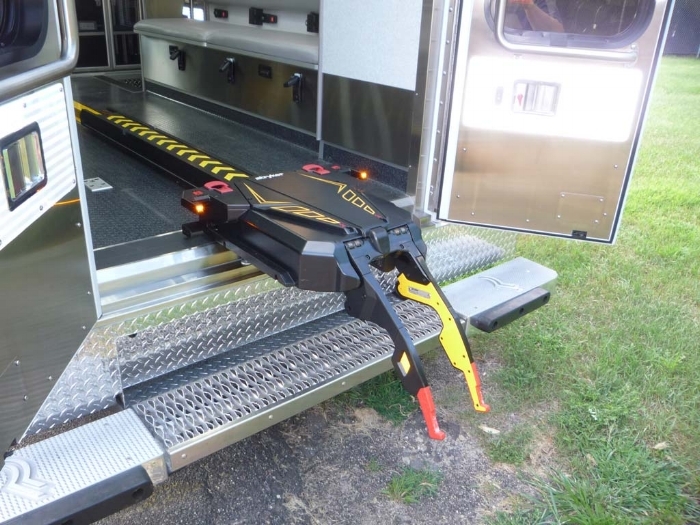 Prior to this innovation of this "power load” and retention system there had been no change in the way cots are mounted inside ambulances (in the US) since the 1970s. Typically, my articles stay out of “the weeds”. In this particular article, I’d like to dive deep on one particular issue. 2017 is the year when the cost of our ambulances essentially doubles. This will obviously present challenges for us moving forward. How did this happen? Since 2000, Wintergreen Rescue has used a technique referred to as “remounting”. The box of the ambulance is lifted from one chassis and placed on another when the chassis needs to be replaced. The cost for a remount was historically right around $115,000. Over time, the safety standards related to ambulances changed greatly. Specifically, rollover performance has been heavily evaluated. Universal to all ambulances (no matter the manufacture) was a deficiency in protection for the patient on the cot. The cot simply couldn’t withstand g-forces and would frequently detach from the floor to become a missile during a rollover. Newer style ambulance boxes have more structural components and a cot restraint system capable of surviving a crash. The cot-retention system alone (including cot) cost $40,000. The next issue becomes the chassis. The additional safety components add weight to the chassis which creates handling and braking concerns. The Commonwealth of Virginia passed regulations requiring all ambulances be weighed at an official scale upon being placed in service. To meet their requirements, we must stop using 1-ton chassis and staring using 1.5-ton, which again affects the acquisition cost. The bottom line is, we have dodged this bullet for 15 years. However now we must start purchasing new ambulances as the old ones wear out. Our first of the new class will arrive late this year. Including the cot, the cost will be $251,000. This doesn’t include a cardiac monitor, communications equipment, or any first-aid supplies. Our rolling stock is purchased entirely through private contributions and grants. Your continued support is essential to our operations.